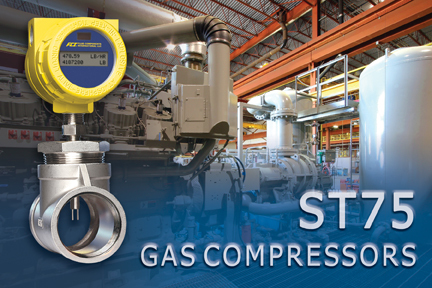 Engineers and technicians who rely on point-of-use gas compressor measurement will find a cost-effective air/gas mass flow monitoring solution with the rugged ST75 Flow Meter from Fluid Components International (FCI). The ST75 Air/Gas Mass Flow Meter delivers precision flow measurement while reducing the consumption of energy fuel gases, specialty gases and pneumatic air. The ST75 Flow Meter is designed specifically for demanding process industry and manufacturing assembly plant environments with its rugged and highly reliable, proven performance. Offering an extensive set of standard features, the ST75 Flow Meter is designed for line sizes from ¼ to 2 in., which is ideal for compressor gas line measurement, and provides three unique outputs — the mass flow rate, totalized flow and media temperature. To ensure reliable performance under variable process and plant temperature conditions, the ST75 Flow Meter’s design includes media temperature compensation. It offers accuracy to within 1 percent of reading and 0.5 percent repeatability. Its precision flow element has a no-moving parts design that employs platinum RTD sensors embedded in equal mass thermowells with microprocessor electronics that can be calibrated to laboratory standards for CO2 as well as many other gases.